The days of having a single technology or software solution to run an en tire business has become a thing of the past. Collaboration among providers and suppliers with the aim of delivering better businesses is the only game in town. Business re-engineering has come of age and, as businesses such as Amazon. Google, Apple and Ocado- to name a few­ demonstrate an agile approach to business technology that has ushered in a new mind-set among many business leaders. Businesses are in a permanent state of continuous improvement. Business re-engineering is distinct from mere process re-engineering, which typically has a start and end point, and is not about one solution or a single employee overseeing a project. The combination of a range of solutions and expertise means this process is one where responsive technology, employees and suppliers work together coherently because one size does not fit all. More than ever before, business uses technology to add customers, suppliers and other partners to the value chain. Information Technology breaks down communication barriers between the disparate parts of the value chain and empowers staff and suppliers to make decisions and interact with customers. Business re-engineering requires taking a broader view of IT and business activity an understanding how one can drive and enable the other. IT is more than just a collection of too ls for automating and mechanising processes; it is the enabler of business re-engineering because it can now reshape the way business is done. In the highly regulated world of financial services, where sales and capital markets endure more scrutiny than ever before, some areas of operational reform such as product delivery offer the prospect of better efficiencies and greater margins without some of the regulatory constraints that enforce otherwise costly practices. 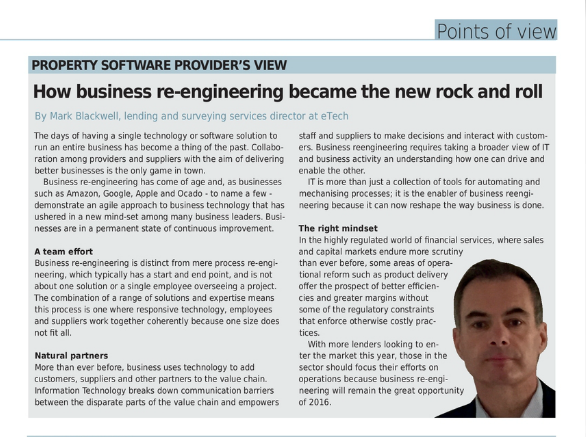 With more lenders looking to enter the market this year, those in the sector should focus their efforts on operations because business re-engineering will remain the great opportunity of 2016.